This is a picture of a newspaper I saved. When significant world events occur, I would always save the paper. This is a practice that is sure to go the way of the dodo bird. For many, the 9/11 newspapers will be the last one they keep. Did you keep a 9/11 newspaper? I remember one of San Francisco's papers had the awesome headline: "Bastards". That's a word those Islamic terrorists hate being called. But of course, they were bastards. I kept a copy of the London Times from 9/11 but I don't remember the headline.I was in England on the Beatles' Magical Mystery Tour when the towers and America were attacked. 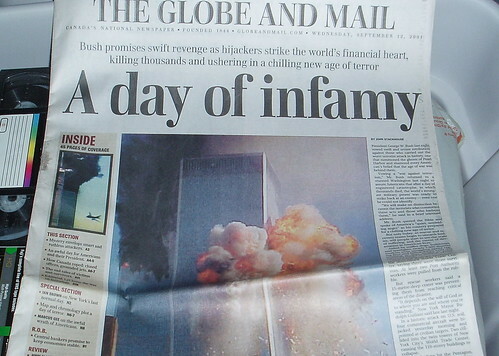 I still have the National Post front section from that day. Ofcourse it's very yellowed now. I was trapped in St. John's and never got a paper. "Funny Man John Candy Dies at 43"
You know, I'm sure I'll get heat for this - but I have to say that the Americans need to move on and stop acting as though there are the only nation in the world that has had to cope with terrorist attacks. Yes, the World Trade Centre 9/11 attack was on a scale never before seen. Yes, we should be trying to get the bastards who did it and yes, I feel for every one of the innocent people killed in the attack. But, come on, to read the American media you'd think that no other nation has ever had to bear what they did. talk to people in Madrid or Bali or here in London. They've all been hit SINCE 9/11 - yet they don't mark every passing anniversary as though it's some national watershed. In London, one year after the subway bombings, everything (tubes, trains, buses) all stopped at the hour of the bombing. That was it. Not that it isn't mentioned, but it hasn't become this "big thing" endlessly rehashed every year. Enough all ready America. Get over yourself. There's been way more hurt inflicted on other nations since. Way more. Argie, the Toronto Sun also had the headline "Bastards". Yes, I kept the papers and I have the Globe from Sept 12 showing a praying woman in a Washington church with the headline "Bush girds for War". Romy - did you ever consider that Americans ARE moving on, and maybe it's the MEDIA that won't move on? Seems to me New York is doing just fine...enough with the bigotry please. I'm the Princess of saving newspapers on these significant days. I'm only the princess because my mother is the Queen. She has given them all to me, but she kept the day after Kennedy was shot, first man on the moon, last day of the Toronto Telegraph and first day of the Toronto Sun.. I have kept all the Blue Jay runs in the last 30 years.. it has come in handy and both Lloyd Moseby and Tony Fernandez were interested in reading them when I asked for their autographs. I also kept all the papers from the day both of my children were born. To the point of the post, I too save important newspapers in history. Positive and negative events, family births, sports, etc. I have a weeks worth of every New York/New Jersey newspaper I could get my hands on from September 11th - 18th. I included the 11th so we can look back on a pre-9/11 world and how mundane, in comparison, things were. ^ Wow, 25 cents! The appreciation on that thing is flippin incredible! It was worth, what? $0.005 the day after it was printed? But of course, it's in mint condition so I can understand. I liked the Toronto Sun's cover: I think it read BASTARDS in large type one the front. While cleaning out her grandparent's dresser, my wife found a globe and mail article during WW1 - don't remember the date. Surprisingly, not a lot of war coverage. In October 2002 a terrorist bomb in Bali (Kuta town) killed over 180 people. Three years later, suicide bombings on the island killed over twenty people.